Buddha once said there is a Buddha in everyone; just one needs to identify him within to become awakened and enlightened. Walk for Enlightenment Tour gives a pilgrim an opportunity to go back to the important sites of Buddhas life and live the life like our master. By embracing the simple lifestyle, we walk through the temples, stupas, monasteries and villages that hold great importance in shaping the Buddha to understand the lord in a better way. Walk for Enlightenment Tour is an attempt of taking you back to the life of the Buddha, to be like our spiritual master and attain awakening of life. Upon arrival at Gaya Airport, meet our representative for a drive to a local Buddhist temple and prepare for your monkhood. From here, we start the journey of knowing and embracing Buddhas life in the real way. Lord Buddha renounced his material wealth and pleasures in the quest for ultimate truth. And the first step he took towards this was shaving the hair. With this, he freed himself from one more link of the material world. Our pilgrims can also take the same step like our revered Sakyamuni and renounce worldly links in the beginning of this pilgrimage. A special head shaving ceremony with mantra recitation ritual by monks is a part of this pious beginning. Next, the pilgrims receive the robes from monks as a blessing for a spiritual trip. Robe donation by the devotees here is also scheduled. However, it is optional for our pilgrims to take this austere path towards devotion. But the main essence of this day is to prepare for the Buddhist Pilgrimage in mind and in spirit by adhering simplicity and the Buddhist way of life. Lunch within temple premises. Overnight in temple. 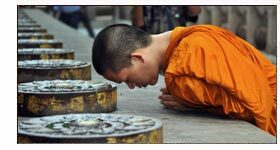 Begin the morning the way Buddha used to do daily  wander as a monk and collect the alms for breakfast. After breakfast, bow and walk to the Great Mahabodhi Temple Complex, the center of reverence and spiritual home for every Buddhist. Under the sacred Bodhi Tree, Prince Siddhartha sat in his meditation on the full moon night and attained enlightenment after wandering as a monk for six years. Here, he became the Buddha or awakened. 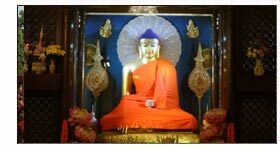 A guided walk through the Mahabodhi Complex will introduce you to the rich history of Uruvela (Bodhgaya) and its direct association with Lord Buddha. Here, he spent seven weeks in meditative state after enlightenment. The seven weeks are characterized by seven sacred spots, namely - Bodhi Tree, Animeshlochana Chaitya, Ratnachankramana, Ratnaghar Chaitya, Ajapala Nigrodh Tree, Muchalinda Lake / Lotus Pond and Rajyatana Tree. 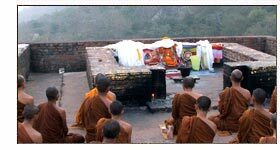 All of these sacred spots are also present in the modern day Mahabodhi Complex. One by one, we cover the sites with a guided tour and a brief 15 min meditation session to follow the master and experience the ultimate awakening he experienced just after enlightenment. Donate butter lamps here in Mahabodhi Temple, also a world heritage site. After enlightenment, Gautama Buddha went to the River Nairanjana and took a dip in its pristine waters. Next stopover is Niranjana River. Though the river doesnt exist, the spiritual presence of our lord makes this site a subject of reverence. Sujata Village (Senani Village), the next Buddhist site marks the location where the young maiden, Sujata offered the rice milk bowl and ended Sakyamunis hard asceticism. This incident also inspired him to walk on a Middle Path in every front of life. Such is the glory of Sujata Village. Here, the exact site where he received the offering is marked by Sujata Temple. We remember this glorious incident from the masters life by distributing the sweet rice milk among the locals. Lunch at hotel. Return to hotel for rest. Optional visit to Dungeshwari Caves. Here, Prince Siddhartha performed austere meditation for years and reduced himself to a skeleton. The location is very sacred among Buddhists as the site purified by lord himself through continuous meditation. In the morning, step out of Uruvela (Bodhgaya) and drive towards Rajgir. This city held a lot of importance in Buddhas life. When Siddhartha renounced his royal heritage, he came to Rajgriha in the pursuit of salvation. Bimbisara, the king upon knowing the presence of Sakyamuni came down to meet him and offered him half of his kingdom. But all he received for this gesture was an assurance that whenever the prince achieved his enlightenment, he would immediately return to Rajgir. And when that time came, King Bimbisara offered Buddha a monastery called as Venuvana Vihara. Nearby is the Karanda Tank where Buddha used to bath more often. After collecting breakfast as monks in Rajgir, visit Griddhakuta / Vultures Peak and marvel at the site where Buddha meditated and even preached sermons like Lotus Sutra. Here, we remember the same piety and devotion as a follower towards Lord Buddha and his teachings by arranging a special group meditation at Griddhakuta, Rajgir. Next in discovery of Rajagriha is Jivakambawan. Jivaka was the most celebrated doctor in India and the royal physician of Rajagriha. Here, the physician himself attended Buddha, dressed his wound and presented him this mango grove. After lunch at Rajgir, transfer to Nalanda, the worlds first and oldest residential university complex. It was the center of learning and education that attracted students from different parts of the world for its diversified subject knowledge. Even Lord Buddha lived and taught occasionally in Nalanda. Later, it became the center of Buddhist learning and teaching. Also, bow down in front of Sariputta Stupa, an imposing structure enshrining the mortal remains of Sariputta, one of the chief disciples of Buddha. Return to Bodhgaya for overnight stay. 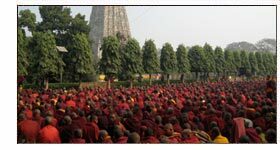 In the morning, we walk through the Monasteries of Bodhgaya and witness different ways and forms of following the spiritual master, Gautama Buddha. Visit the local temple and cook food for the monks in their kitchen. Buddha believed in serving the society, so this is the ideal way to experience the joy of service. After serving others, have lunch within the temple premises and we leave for Varanasi, the oldest continuing city in India having a respected place in Hindu religion. Though the paths of Hinduism and Buddhism are different, but both share the same ultimate goal of life, i.e. liberation of soul from the cycle of births. The better place to experience the liberation of human form is Varanasi. Upon reaching here, begin an evening boating tour through River Ganges. The center of attraction in Varanasi, River Ganges is always bustling with life  in and around its Ghats. Evening comes alive with lamps lit and Aarti sung in glory of River Ganges, the lifeline of Varanasi. Return to hotel for overnight stay. Morning, transfer to Sarnath (Issipattna or Rishipattna), where Buddha delivered his first sermon to the first five followers. The essence of the spiritual master is still present in Sarnath. The air still carries the fragrance of Buddha and deer still wander through the location reminding us of the landmark occasion in Buddhist history. We begin the walk tour through Sarnath by visiting Archaeological Survey of Indias Museum. A treasure trove of Buddhist sculptures, antiques, inscriptions and pottery, Sarnath Museum features finest images inspired by the life of Buddha. Also, here you can even see the magnificent Lion Capital, which once crowned the Ashoka Pillar at Sarnath. It is also the official emblem of India. here, we walk through the Sarnath Complex and remember the glories of Issipattna as the hosting site for Buddhas first sermon. A deeper experience awaits us as we move towards the Dharmarajika Stupa. This was built by Mauryan Emperor Ashoka to enshrine the relics of lords mortal remains. A walk through the ruined monastery complex takes you to Dhamekha Stupa. It marks the location where Lord Buddha delivered Dharmachakrapravartana, Middle Path and Four Noble Truths of Life for the first time to the five ascetic followers. Mulgandhakuti Vihara was the favoured meditation site of Buddha during his vassavasa / monsoon retreats. To remember the same of Dharmachakrapravartana and initiation of Buddhism, we attend one hour discourse by a Senior Monk on the practical teachings of our spiritual master. Lunch in Maitreya Buddha Temple and before leaving Sarnath; donate incense, flowers and blankets. Next, visit Sarnath Village and observe the process of handicraft making. Have tea with the locals in the village and experience the genuine welcome and hospitality of Incredible India. Atithi Devo Bhavah (Guest is God). Early morning, transfer to the Varanasi Ghats for a special one hour Yoga session under the guidance of an expert Yoga practitioner. Yoga is seen as one more linking force between Hinduism and Buddhism & also is a great way to reconnect with your soul. Next we begin the boat ride to experience the early morning rituals around Ghats of Varanasi. Witness people taking sacred dips in the River Ganges, worship Sun God and the holy river, offering morning prayers, or consulting to the local astrologer during this river cruise. The bathing Ghats of Varanasi are always full of life. And this early morning boating offers an opportunity to experience the life around Ghats in full form. Sailing through the abundant experiences, the boat tour brings us to a point where we witness the ultimate truth of life, i.e. death at the cremation banks of River Ganges - Manikarnika Ghat. It is a belief that the cremation performed here transports the soul to final liberation. Witnessing this ritual is important in our journey as well because it reminds us of our next destination where Buddha final liberated himself from the cycles of birth and death, i.e. Kushinagar. The morning at Kushinagar prepares us to witness the ultimate truth of life, i.e. final liberation. Every human wants to achieve the Moksha, and Buddhism shows us how to realize the ultimate goal of life. After collecting and having breakfast, begin a walk towards Mahaparinirvana Temple. Here, we perform the Pooja under guidance of a senior monk and pay respects to the Lord. Next, we walk towards Ramabhar Stupa - Buddhas cremation site and offer incense and candles here. Later, we visit a Village in Kushinagar to observe the villagers way of simple life. Lunch in Hotel. Post lunch, we visit a Charitable Dispensary. As Buddha believed in giving, we donate medicines and medical aids for the benefit of villagers. Overnight in Kushinagar. After collecting and having breakfast, leave Kushinagar for Lumbini, the birthplace of Buddha. Upon arrival, check in the hotel. After lunch, walk towards the Mayadevi Temple, dedicated to Queen Maya, mother of Prince Siddhartha. Ambulate around the temple complex and bow around Pushkarini Pond. It is believed that the queen took bath before giving birth to Buddha. Perform a walking meditation within the temple complex and feel blessed after completing the Buddhist pilgrimage. After that, visit the Ashoka Pillar commissioned by the Mauryan king after he exempted Lumbini village from tax under his rule. It is also a world heritage site. Donate Prayer Flags in the Mayadevi Temple, Lumbini. 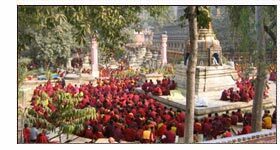 Evening is free for walk around the different monasteries of Buddhist countries in Lumbini. Here we witness that the path to devotion may be different, but the essence of Buddhism is same. Overnight in Lumbini. After breakfast, transfer to Bhairahwa Airport to board connecting flight for Kathmandu, capital of Nepal. Upon arriving in Kathmandu, one of the modern cities in Nepal, we should keep in mind the teachings we practically incorporated in our life during the last eight days. Also, we should try to incorporate the teachings we learnt in our daily as a real tribute to Lord Buddha. Same is the case with Swayambhunath Stupa, one of the oldest and glorious Buddhist heritage shrines in the valley. The four sides of the temple again have the watchful eyes of Buddha, giving us a symbolic interpretation to keep our acts in check and adhere to lords teachings. Here, we take this final teaching with us and return to the hotel for overnight stay. After breakfast, transfer to the airport to board connecting flight for onward destination.